Photographer Laure Fauvel's series 'Terreurs' turns an age-old rivalry on its head. 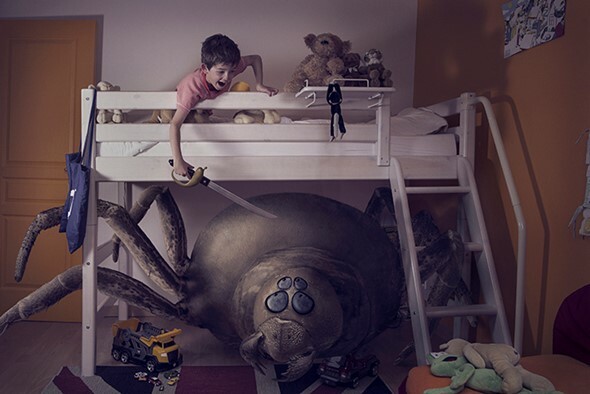 The retouched photos depict children fighting back - and winning by the looks of it - against the monsters that typically terrorize them in the night. Children wielding toy weapons keep the nightmarish creatures cowering in closets and under beds with fearful expressions. Fauvel created the series in her last year of school at Gobelins l'école de l'image. Wanting to create images where children are empowered rather than victims, the monsters were created in Photoshop in part by compiling images of different animals. With school complete Fauvel is seeking work as a digital retoucher in the Vancouver area. The idea isn't necessarily without merit, but the interpretation and resulting photos are lacking. These monsters that look straight out of Pixar's Monster's Inc just don't do it for me. Still not completely sure who the audience is for these images..
As adults we can quickly see the irony, and for many the triumphs over our own fears, to the extent that some move on to critique. For children however, I am more than a little apprehensive that some might take away the validation in becoming a monster themselves through the imagery of terrorizing something/someone that is clearly afraid of them.. I personally would have chosen the visual of standing their ground, facing their adversary, prepared to vanquish their childhood imaginary fears. love this set! lol...very nicely done! Cute, humorous, and entertaining. I like them. Good luck with the trial. Great education lessons, next to only Halloween delights. These look like they were fun to shoot. I still see the nightmare from pic #1 occasionally, only with more spiders. I'll try the sword thing, thanks! Remind me never to publish my work for all the 'DP CRITICS' to shred into a million pieces! PETA called and said they were fine with it, but PETM are stirring up a storm at the moment. Aahh for the simple days when monsters were hairy creatures that lived under the bed or in the closet... now as adults we see real monsters every day... in the office, in our government, and beheading folks for the sake of their new caliphate! Are these photos or CG? Poor monsters and evil children, liking to kill and frighten the sorry creatures. I give this a 2 on a scale of 1-10. That it gets a 2 and not a 1 is because it was a rather unexpected series of photos. The kids are not realistic. The nightmare monsters are not nightmarish, rather funny. @Roland Karlsson Were you raised in a Orphanage? So you want scarier monsters, and children who look more 'realistic' fighting them in their bedrooms? Sheesh, just watch Harry Potter or LOTR or something. Or perhaps look up 'catharsis' and begin to understand the fun and psychology behind this cute series. Some rude people here obviously. I do not like them. I think they look silly. I have seen much better illustrations. And if you do not agree, say so ... without shesh, face palm or other stupid comments. How about we agreed to disagree and more people like it that you...done! Why not ... I have not said anything else. It is disagreeing and being rude I do not agree with. Seems unnecessary. Excellent lighting and treatments. Very tasteful. Well executed and entertaining concept. Pro-violence and pro-gun-lobby propaganda. So pernicious to start at childhood! Indeed. People should be taught at an early age that the only recourse to danger is to call 911 so that a Good Guy can show up with a gun. I applaud the reach for new ideas. Unfortunately this looks like a reach. Sort of a anti-Monster's University theme. Photographers, like other artists, are desperate to find ideas and style that set them apart.These aren't to my taste but commend the creative courage to try. Some children have really disturb dreams. I wonder if a few wack to the head will help. Although I think the series is fun, and might particularly appeal to children, I do find the elements (child, weapon, monster/beast) become a bit tedious, formulaic. On a separate topic, those criticizing the inclusion of weapons should I think recognize that these are toys (though toy weapons may themselves may be controversial), and the scenes are, in large part, symbolic allegories. It's a nice effort, but at that level of attempted realism, the CGI work is subpar. She's lacking some fundamental knowledge of visual art, such as how to cast shadows properly in perspective according to light source's angle relative to the subject and vanishing points. That is first year concept art/illustration/industrial design stuff in a good art school. The creatures themselves are also a bit flat and unconvincing. A much better choice would have been using 3D and doing photorealistic renders that look more like the kind of realism we'd see in movie special effects (which is totally doable with cheap, off-the-shelf 3D software these days if you have the skill). If you guys want to see this type of work done at the professional level, go to cgsociety.org and look in the galleries--all are works done at the level of Hollywood blockbusters, but often by young CG artists who specialize in this type of work, and many are not even pros but hobbyists. I think the absence of absolute trompe l'oeil might be a conscious decision on the part of the artist to make reference to storybook illustration. I'm sure she was chuffed and her friends impressed ... Which is what it's all about. Know it all art/photography snobs I'm sure are the last of her cares!!!! Rob, I'm sorry but either I may have missunderstood you, or you really came up sounding an arrogant pr#ck. Do you really know anything about 3d ? I do. I've done countless of CGI scenes for short movies, and I know how insanely difficult it is to achieve 2% of what Hollywood does. "the CGI work is subpar" WHAT ? "which is totally doable with cheap, off-the-shelf 3D software these days if you have the skill" WHAT ???? Do you know anything about this, or do you just pretend to know it ? Do you REALLY know how difficult it is to do proper CGI ???? @marcio - I think you misunderstood. My comment wasn't to degrade her effort--it's was about the choice of tool/method not being best suited to the subject matter. I'm actually a veteran art director in the entertainment industries, having worked in video games, film/TV, comics, illustration, etc. Doing great work in 3D isn't any easy, but it's better suited for photorealism. In order to achieve the same level of realism 3D is capable of with only 2D (photo piecing and painting), you'd have to be a master artist of very advanced level, and artists at that level are usually working professionally as matte painters, concept artists, illustrators, etc. If she had used 3D, she could have avoided the issues I pointed out. It would have taken just as much, if not more effort, but the results would be more compelling (assuming she meant for the creatures to look as realistic as possible, and it does seem that was her intention). I also want to say that the only reason I made the original comment, was because she got so close to her goal, but due to the choice of tools/method, she couldn't take it further, and I'm pretty sure if she had been given the choice, she would have liked to be able to push the realism of the creatures a bit more (but we won't know unless we ask her). If her effort was bad, I wouldn't have commented in the first place. Also, I commented because what she attempted to do falls into the realm of CGI/VFX work, and my comment was more a symptom of my profession (I do this stuff professionally as well as teach it). Ultimately, if she got a lot of joy from doing the images and they brought joy to people who saw them, then that's all that matters. It wasn't supposed to be 100% realistic. You totally missed the point of this. And now Mr Know-it-all backtracks! I apologize if I sounded too harsh and arrogant. I really do. I understand now your POV. I agree, as I'm also a CGI artist (just a hobby, while photography pays the bills), I love 3d animation and also tend to prefer 3d, even in those cases a simple 2d work in Photoshop or After Effects would have got the job done (in less time, and less efforts). The only part I disagree is that she necessarely should have gone this route... maybe she doesn't have free time or experience to do photo realistic monsters, with fur, rigging and all that stuff. In that case, it seems her method of choice was effective enough, and got the job done, while not 100% real, but a very close 90% (??) real. There is a lot of presumption here that because the skills were present to tackle the subject in the way it was, that 3D should have been a viable alternative. There is absolutely no logic that dictates the 3D was even an option. I know it seems like 3D artists are coming out of the woodwork, but I am a 3D artist working in films, but have also done games, TV, and music videos, and I think it would be much more difficult to achieve this result with 3D, let alone photo realism. Modelling a creature, texturing it, rigging it, adding fur, posing it, and then rendering it. I think the route chosen was probably best. @CAClark 100% agree. All these new wannabe know it all internet 3D experts think they have all the answers yet always take the most complicated and unrealistic route to solve problems! You complete and utter plonker. Good fun but I suspect children's real nightmares are more subtle than these creatures. Smart idea... I've long been tired of the "creative children photos" where the kids are fairies or miniatures or whatever. This one is at least something new. Sadly, execution is lacking in this series but I'm sure we'll get five hundred better copycats by the end of the year plus a trillion instagrams. Creative and nicely done. Why does everything have to be run through a PC filter? We all need a sense of humor. 6 identical pictures of kids pointing weapons with the same unbelievable "green-screen" open mouth expressions, and fanged monsters added in post. I wouldn't say this is a new DPreview low, but really don't you have better things to with your time than repost crap like this? Don't you have camera reviews to catch up on? Looking at this is like Canadian Tire money; the second after you exit the store you throw it away. Well then let you show us your pictures, so we can decide how good you are as a photographer? Why does the photographic community keep answering with the knee-jerk reaction 'well show us your photos'. Does only one person in each industry world does have the right to criticize anything in their field, or can you only have the right to criticize those that are worse than you? Also, how exactly do we recognize who is a better photographer? Do we vote publicly? And how can we vote if we can't criticize? Can we only vote between photographers which are already worse than us? And how do we get to that decision in the first place? Or is there any photographic authority who gets to decide who is good and can criticize and who isn't? Also, I've always thought that photography is not a competitive sports, but I guess I was I wrong with that too, with all the small pi$$ing contests going on among photographer, e.g. who can make a 'better' picture with a bad camera or whose sensor is bigger. But do it right - Tell us what you like then tell what you would like to have seen better. But its too easy to say that something is 'bad'. What some people do here is complain not criticize . Or as the expression says: The best helmsmen stand on shore. Prairie pal, I'm with you. These things remind me of the appalling things Dave Hill does. Criticism should be heard and considered regardless of source. However, as an art teacher, it is one of my responsibilities in an academic setting to foster helpful dialog. Stating ones perception, response, personal opinion of work is helpful in so far as it is articulated with adequate explanation. Problematic criticism is that which makes broad universal declarations of value of a given work e.g. saying something is "crap"; this is usually a sign of being rigid and cocksure. In a context such as DPR, acknowledged as different than a classroom, many will enter into such behavior without considering common etiquette. And I think that the basis for calling someone out to pony up work - though I disagree with that as general practice. It is a frustration with those who speak in a cocksure manner, yet often do not explain their declarations. Do you really believe that such features steal resources from reviews? That has been stated by others on various ocassions, and each time I find that notion a bit ridiculous. Saying it's not to your taste is one thing; calling it crap and comparing it to looking at Canadian Tire money is just a little over the top. It's possible to be critical and have class at the same time. Sigh... looks like someone doesn't get why it's called 'series'. Also you should know some people do collect those 'canadian tire money' to something useful. If it's not your cup of tea, move on. Please don't vomit your negativity all over, for everyone else's sake. "...and fanged monsters added in post." Why couldn't they have hired live monsters for the shoot. We should check with Calvin and Hobbes about monsters under the bed. Swards and guns, and more guns. Lets teach our children about violence at the earliest age possible, Teach them that weapons will solve problems, at home, at school, and the work place. The short sightedness of DPR (and so many others) is why America can't build prisons fast enough. Wake Up. It must be awful living with you. I say the children should fend off the monsters with karate. Really quite similar to the violence in other children's narratives e.g. Peter Pan. Very little credible evidence exists that violence in this sort of narrative has a causal effect in relation to real violence. The photographer is not American. StevenMajor get over yourself already...seriously...I can't believe how many of you fools have to try and stoop to the 'gun debate'. Personally I don't like the photos...the processing is sub-par IMO, but the guns I could care less about. Thumbs up and very well made images. The children are frightening the monsters! If the monsters are a minority, this is not political correct! We should alarm the UN! Sorry, wrong forum. You want Townhall or National Review. You shouldn't talk about ex-spouses that way. "It's a scientific fact that monsters live under the bed"
It's a scientific fact that communists live under the bed. When I was young, I was always scared of an imaginary hand that would come from under my bed to grab me. Wonder which of the monster it belonged too!?? And seriously.. these are whimsical and fun IMO. What a fantastic ability to incorporate humour into otherwise banal childrens photographs! Hurrah! I know! Monsters gotta eat, too! Great stuff! Really brought a smile to my face.